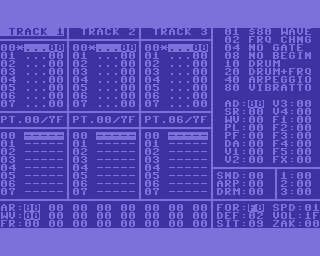 In my post “PROGRAMMING, USING, OR GAMING” I used a screen shot of a Commodore 64 music editor called GMC, because it looked primitive, with the default text and background colours, like some early C64 software. I had no idea it was released in 1990. I’m trying to limit my blog to the period early 1984 to April 1985, when I owned a Commodore 64. This is because I think that Commodore, like other computer companies should have provided users with the means to program the C64 at the time it was released, or very soon afterwards, instead of relying on someone else to do it for them later on. Atari provided Atari BASIC, supporting their hardware from the beginning. 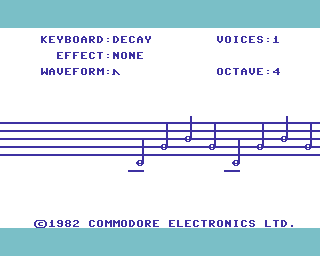 When I bought a Commodore 64 I was convinced that I would soon be programming it to play music which I’d written myself and that I’d do this using the BASIC built in, then I could include this music in programs which also did something else. As I was leaving the shop, I asked the salesman “How do I access the synthesizer circuits?” He told me the filthy lie “It’s easy! You just use PEEK and POKE commands”. I had no idea this would be even more difficult than the geometry problems I used to be kept in for at lunchtime and after school, or even impossible. I think he deserved a prison sentence and to be POKEd with a sharp pointed stick, as well as me finding out where he lived, then having a PEEK at him naked in his bathroom, taking some pics and sticking printed copies up near his shop, with a caption saying something like “Have a PEEK and POKE at this shopkeeper. PEEK and POKE is easy!” After this he should have been sent to prison for fraud. All of this would have been a fitting punishment for saying “It’s easy! You just use PEEK and POKE commands” and him later refusing to refund the money. The whole situation was caused by Jack Tramiel, of course. I don’t think this would have happened at Silica Shop, but my Dad was just trying to save a small percentage of the total price of the C64. I think that Silica Shop staff would have tried to persuade us to buy an Atari with 100 free programs, but as they sold and knew about various computers, when they heard I was determined to learn programming they’d probably have warned me not to buy a Commodore 64, and certainly wouldn’t have made the outrageous claim that PEEKing and POKEing is easy! Apart from this, it also seems that Silica Shop may have allowed people to trade in their old computers, hence their limited stock of Atari 400 and 800 models. I didn’t watch the TV series “Magic Micro Mission” or “Bad Influence”. I remember watching Database on ITV, “4 Computer Buffs” on Channel 4, “Me & My Micro” on ITV, “The Computer Programme” on BBC1 or 2, “Making The Most of the Micro” on BBC1 or 2, and “Anything We Can Do” on Channel 4. I think all these TV programmes influenced my decision about buying a Commodore 64, then later on replacing it with an Amstrad CPC. I also had a fantasy about travelling to Hong Kong, or somewhere else in the far east, buying an Apple ][ clone, complete with software, then bringing it back to Britain, which allegedly would even have saved money compared with just buying an Apple ][ from a dealer in London! Hard to believe, but it’s all explained in http://www.youtube.com/watch?v=yQBfq5t-g64 . “Micro Live” was a BBC TV programme, which started with two specials in October 1983 and Summer 1984, but didn’t become a regular monthly series until October 1984, when I’d already been suffering in C64 hell for a few months. While researching which computer to buy to replace my C64, I wrote a letter to “Micro Live”, asking for a quick comment on air explaining the quality of Amstrad CPC sound, which was based not only on the popular AY-3-8912 sound chip, but also their very powerful ENVELOPE command, giving unprecedented control over it. I just got a letter back, which was inconclusive, perhaps because I mentioned what a presenter on another series had said that synthesizer chips should be able to produce sounds like breaking glass. Amstrad sent me a photocopy of several pages of their CPC464 manual explaining it. I’m worried that the ITV and Channel 4 have no copies of their computer programmes left and there’s hardly any clips on YouTube, unlike with “Micro Live”. Sadly, “Micro Live” co presenter Ian MacNaught Davies died in February 2014. “Anything We Can Do” was difficult to find any details of but eventually I found http://www.tvcream.co.uk/?p=564 . The main cast members were Helen Watson, John Bleasdale (masked as a robot in Doctor Who “The Robots of Death”), and Mike Halls, but I also found other actors and actresses by the names John Bleasdale and Helen Watson. It was a bit like a soap opera, based round a couple where the woman was a teacher, and the man’s Dad. It started off with the Sinclair Spectrum, which the Dad brought round and plugged into their TV, the BBC Micro being used at school, and what I think was the original Apple MacIntosh being viewed by the Dad, or at least something with a mono desktop environment that looked similar to an original Apple MacIntosh, but perhaps it was an Apple Lisa, or even a Xerox Star. I was very confused and thought the MacIntosh desktop environment was a database! A teacher even accepted this answer from me, but perhaps he hadn’t seen the series. I think this series was shown in early 1984, but made in 1983, so it would have been difficult to get a Apple MacIntosh for filming, or that could have been the very last sequence filmed. I remember that Mike Halls was talking about getting a computer with two disk drives, one for the program disk and one for the data disk. I had only seen this type of setup with an Apple ][, but it could have been some other kind of computer, such as a Commodore PET, or a CP/M machine. I think that “4 Computer Buffs” was brilliant! It even featured regular short programs or demos from members of the public, including one written in Forth, with made up commands such as BANG TPL. Only a few clips are on YouTube, including the launch of the Atari ST and XE computer ranges, and a slightly inaccurate or biased review comparing the BBC Micro Model B to the Sinclair QL and the Amstrad CPC464. I don’t know why these three computers were chosen, but they were all widely available from chain stores and all had excellent versions of BASIC. I taped the episode with this review, then watched it with my parents. My Dad nearly had a fit over details of the Amstrad CPC464 keyboard. He was wearing glasses with bifocal, or even trifocal lenses, or perhaps a very old pair which no longer suited his eyes, then he got the idea that the reviewer said that if I got an Amstrad CPC464, or even the new CPC664 which I was waiting to be released, I’d be typing on a rubber mat instead of a WP type keyboard! I quickly told him the Amstrad CPC keyboard was about the same quality as the C64, which he claimed had “definite keys”, but he’d never used it. I then rewound the tape and corrected his error, which was that the rubber membrane was inside the keyboard. The reviewer had the cheek to say that Amstrad graphics were “let down by their resolution”, when in fact the Amstrad used the same graphics chip as the BBC Micro (the 6845), but set up with a border limiting it to 200 dots vertically, instead of 256. 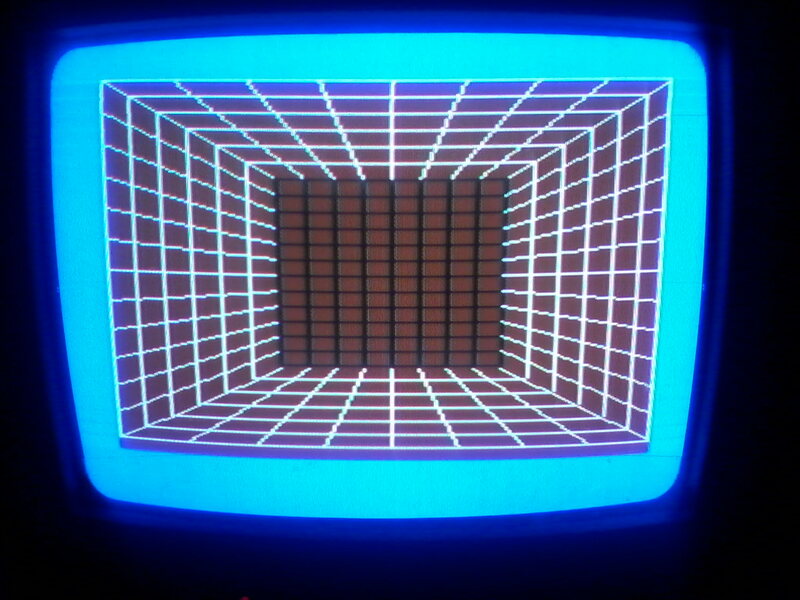 Lots of games were programmed to use the 160×200 16 colour mode, though. I later typed in a listing on my Amstrad CPC664 which turned off the border, like the BBC Micro, but I don’t know if it also increased the vertical resolution to 256. The Amstrad CPC range has a palette of 27 colours, compared to the BBC Model B’s palette of 8 actual colours, which it treats as 16 logical colours, including flashing colours and switching colours for neon sign type animation, but he pointed out that the Sinclair QL could only manage 8 colours. Here it is http://www.youtube.com/watch?v=Zo7jnQXvtNo . Of course, if even I managed to get confused enough to think that using any non games software on a computer was called programming, then lots of other people must have thought this as well, because tests have shown that my IQ is almost as high as Bill Gates, but I didn’t go to a private school where I could have the chance to use a computer several years before almost anyone else! Games consoles weren’t designed to be programmed by the general public, because they had no keyboards or devices such as cassette or disk drives available to store programs. Some companies, such as Atari, and Coleco, made a keyboard and limited Atari BASIC language available, or Coleco’s clone of Apple BASIC for their consoles. I didn’t and still don’t know how to suppress the Spectrum’s scroll prompt, because I’ve never owned a Spectrum. I think I’ve probably missed out by never owning one, so I hope to learn more about it in a really good emulator soon. I used to write pithy graffiti on toilet doors and walls, but now I’ve moved on to more creative writing like this with replies via email, instead of two word graffiti replies, so that proves things like this happen. Now for a story about the magazine 64’er, which TMR can’t even read, apart from the program listings! This magazine, by the company Markt & Technik (who also published “Happy Computer” magazine, as well as various books), started in Germany in about April 1984, which was the same time I got a Commodore 64, but due to language censorship and lack of distribution, I don’t think I ever heard about it until 2012 or 2013. A full, scanned archive of this magazine is now available online at http://www.64er-online.de/download/ , although all the advertisements have been covered up. I think it’s with the publisher’s permission, but if you’re interested I advise you to get it while you can, just in case! 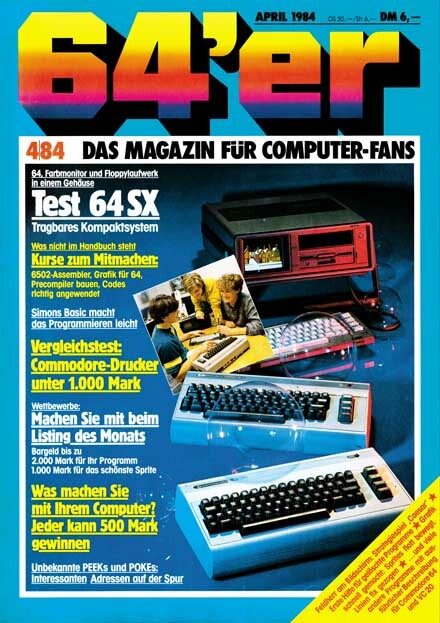 In Britain during the 1980’s, only a few German language magazines were allowed to be distributed anywhere, but 64’er wasn’t one of them, although it’s possible it may have been sold in a few very obscure newsagents. This was in spite of books teaching German being widely available. There were plans to make the main German ARD TV news “Tagesschau” available using some pre Internet technology, but this idea was rejected by a TV presenter with the sentence “What would be the point of it, when so few people would understand it?” The answer was of course, that more people would have understood it if it had been available http://www.tagesschau.de . The “Tagesschau” was shown occasionally as part of the BBC German news series “Heute Direkt”, as well as the Austrian “Zeit im Bild” and the East German “Aktuelle Kamera”. The listings in 64’er magazine were for the Commodore 64, VIC-20, and C16/Plus 4 computers, which would also have worked on those computers being used in Britain. Japanese MSX computer magazines were available from the shop “Japan Centre” in London. The magazine title 64’er isn’t hard to understand, even for non German speakers. If you owned a Commodore 64 you were a “64’er”, because Commodore was the first company to release a “home computer” which came with 64K on board, but by the time this magazine started Atari and some others had followed suit. Interestingly enough, a sequence of commands which is supposed to give access to the whole 64K, although it claimed to make it look like the C64 had died, didn’t actually work on my C128 in C64 mode! I just got the “READY.” prompt. This magazine was also a 64’er and had the title masthead in a C64 type rainbow. It was mainly about the C64, although other Commodore computers, such as the “VC-20” (standing for VolksComputer, meaning VIC-20) and the newer C16, Plus/4, and even the original concept C116 with its calculator type keyboard, were also featured early on, as well as the C128 from 1985. Unfortunately, Commodore soon managed to seize 50% of the home computer market in Germany, so 64’er magazine was devised as a way of helping people who found themselves in the traumatic situation of owning a Commodore 64 or VIC-20, while the lucky owners of other makes of computer could carry on reading “Happy Computer” by the same publisher instead. 64’er magazine got onto the subject of extended BASICs right from the first issue! Amstrad wasn’t active in Germany at this time, but luckily, the company Schneider licensed the Amstrad CPC464 for sale in Germany as the Schneider CPC464, then later the CPC664 and CPC6128 as well, to save more people from the fate of owning a Commodore 64. Even in the first issue of 64’er there are articles pointing out that the built in C64 BASIC V2 was severely lacking. These articles featured fixes for C64 BASIC V2, including in Issue 1 (April 1984) “Strubs” (a structured BASIC pre compiler) and Simons’ BASIC. However, what was even more amazing was that Issue No. 2 (May 1984) included in the Simons’ BASIC Part 2 article short C64 BASIC V2 listings showing how to turn on the graphics screen, plot points and draw lines, although this was supposed to be just to demonstrate how much easier it was in Simons’ BASIC. The BASIC V2 listings certainly didn’t require marathon typing sessions like in Boris Allen’s book “Graphic Art on the Commodore 64”, though. These programs (not counting REM lines) took just 10 lines to turn on the graphics screen, an additional 8 lines to plot some points, and another 18 lines of BASIC V2 to draw some lines on the screen. Unfortunately, these listings were all subroutines which required some variables to be defined before calling them up. This meant it wasn’t straightforward getting them to work, as I recently failed to do. Not only that, but 64’er magazine had a policy of correcting any mistakes in listings in the following issue! They started publishing some amazing type in program listings right from the beginning. Even in their second issue (May 1984) on page 88, they published a listing which enabled Commodore 1541 disk drive users to change the name and ID number of a disk without reformatting it! That’s something that even the C128 software “The Servant” from 1992 can’t do! They also ran a series about doing graphics, starting in issue 1, to try and teach Commodore 64 owners about their graphics hardware and how to use it, although of course with computers by anyone except Commodore, all they’d have to do was type in a program of about 1-3 lines using about 3 BASIC commands. It only took them until part 3 in this series to explain to readers how they could plot points, comparing it to waking up Sleeping Beauty, which is actually “Dornröschen” a German story. They demonstrated this with a short listing to plot a sine curve, similar to the example in the very poorly written “Commodore 64 Programmer’s Reference Guide”. However, unlike the Programmers’ Reference Guide listing, I found it a simple matter to replace the SIN function with a definite coordinate for y, so that it drew a line from left to right! Amazing stuff!!!! This magazine also had a series, published over several issues, called “Assembler ist keine Alchemie” (Assembler isn’t alchemy), starting in their September 1984 issue (09/84), which continued over several issues and was very high quality. It was later published separately as a book, which sometimes appears on eBay. Later on, there were some even more astounding listings, such as “Hypra Load” in the October 1984 issue (10/84). This Machine Code program speeded up the Commodore 1541 disk drive by several times, although, inevitably, some software would overwrite it, causing the disk drive to reset to its normal, slow speed. This caused a big stir wherever people were able to get hold of this magazine, such as German speaking parts of Europe, Denmark, and the Netherlands, but not Britain, where it was unknown, so unlucky C64 owners in Britain who could afford disk drives had to pay out even more money for Jiffy DOS or Dolphin DOS instead. Disk drives for the C64 were more popular in Germany than in Britain, possibly due to larger disposable incomes, or cheaper prices, but I don’t know what the prices were because all the ads in this magazine have been covered up. It seems that in the USA, packages including the C64 with a disk drive were heavily discounted, but according to “Compute!”. the original C64 designers made the commands LOAD and SAVE default to tape, because they thought most C64 owners would be using “Datasette” tape drives instead of the more expensive disk drives. “Compute!” published a Machine Code routine called “Disk Defaulter” to fix this. This means that Commodore’s original masterplan was to leave C64 users with BASIC V2 instead of a replacement language or compiler loaded from disk! Also in the December 1984 issue on page 30, there was an article about copying the Kernal ROM contents to RAM, editing them to improve the OS, then burning this edited version onto an EPROM and replacing the original ROM. The example given deleted the cassette routines (the portable Commodore SX-64 computer ROM was also missing these routines) and pre defined the function keys. Later on, a Dutch company were selling modified C64s with ROMs that had speeded up LOAD and SAVE routines, as well as predefined Commodore DOS commands on the function keys, which they claimed were compatible with 99% of all software. Staring with their Issue 01/85 (i.e. January 1985) 64’er magazine began publishing listings with checksums for each line, produced by their own published checksum type in programs! One of these was for BASIC programs, while the other was for pure Machine Code. They even accepted hexadecimal numbers! I’ve only read the issues of 64’er magazine up to the point when I sold my Commodore 64. There were a lot of good articles about how to program or even fix the Commodore 64 and owners of that computer should have noticed from the masthead that it was about the C64. Unfortunately, it wasn’t published by Commodore, so it was yet another example of Commodore letting other people fix their mess instead of doing it themselves! GMC music editor. Is this programming or using? TMR of the blog http://www.c64crapdebunk.wordpress.com has claimed that most people before buying a computer had already decided that they didn’t want to do programming, but I’m afraid they didn’t actually know or understand enough to know what they wanted to do with it. I remember now that before I got a Commodore 64, I thought that whatever people did with a computer was called programming, with the possible exception of playing games and that everyone who worked with computers in an office was a computer programmer. Before this time, lots of people, including me, had been “programming” washing machines or the timer on video recorders to record TV programmes that were on when we were asleep or had gone out. It didn’t occur to me that I wasn’t actually “programming” the VCR timer at all, but just using a program built into its ROM which someone else had already programmed. It was the same with computers. Games consoles were already available for prices cheaper than computers, but they could only play games, while the big difference between them and computers was that computers could actually be programmed. Lots of people in this day and age may have forgotten, or never even knew that the program above first of all, in order of line numbers, prints “STEVE WAS HERE!” on the screen in line 10, then executes line 20, which tells the computer to GOTO 10, meaning go back to line 10 and print “STEVE WAS HERE!” again. The semicolon at the end of line 10 means don’t start a new line. This makes the effect more noticeable compared to the version without it after the screen fills up printing “STEVE WAS HERE!”, but the Spectrum would keep asking “Scroll? (Y/N)” whenever this happened. It continues printing the message until the user presses a key. The key to press could be RUN/STOP on Commodore computers, ESC, or BREAK on other computers. I think that after writing the program above, most people may have written a few more programs, then lost their way or been brainwashed by computer magazines they read. A very useful short program to write is just a few lines of READ, DATA, PRINT, and INPUT commands which can read questions and answers in DATA statements, which may even have been typed in by the user, then ask the user what the answers are. People can keep running a program like this until they’ve learnt all the answers to the questions, then type in a new list of questions and answers. I used to do this a lot on my C64 and Amstrad CPC664. Of course, it should be obvious to anyone with half a brain that before buying any item such as a computer you should first of all read some reviews of it. People who don’t read reviews before buying are asking for trouble. Sales assistants have a vested interest in selling customers something that their shop actually stocks, as well as in preventing them from going to another shop. My Dad believed a sales assistant he’d only spoken to over the phone who told him “The Commodore is a better one than the Atari”. What this actually meant was “The Commodore is better for me, because I’ll get paid commission and/or keep my job, but the owners of my shop have decided not to stock Atari, so if you buy an Atari, then that’s not good for me”. Let the buyer beware! “Personal Computing Today” magazine, February 1984 edition, showing the Oric 1, Atari 400, Sinclair Spectrum, and Memotech MTX computers, which all had BASIC dialects far more advanced than the Commodore 64! First of all. I think I should briefly de debunk some recent debunks by TMR which aren’t worth their own de debunks. First of all, some Acorn Computer staff in London told me that there was software which enabled the Acorn Electron to produce 3 channel sound. I never planned to attempt this in Assembly Language/Machine Code. A famous two page Acorn Electron ad promoted it as using BBC BASIC, the same language as used in most schools. 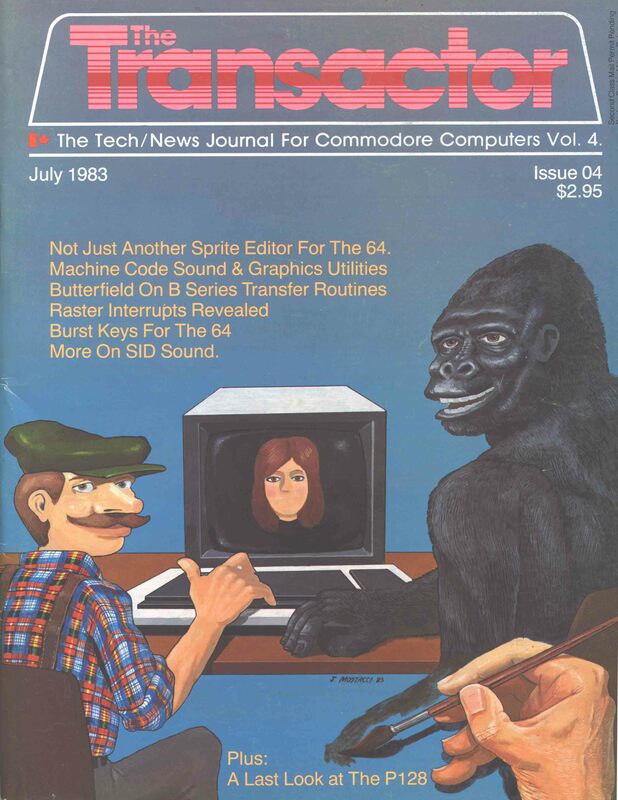 Secondly, I was searching really hard for some techniques that would enable me to program graphics on the Commodore 64, but I never even heard of “The Transactor” until a couple of years ago. Interestingly enough, also in the same Transactor Issue as the “Graphics Utility”, there was a program Superkey-64, that upgraded the C64’s facilities to enable it to enter whole BASIC commands by pressing a combination of keys, like a Sinclair Spectrum or an Acorn Electron already had built into ROM! There was also an ad in Volume 4 Issue 3 for something called a “Stringy floppy”, which basically sounds quite like a Sinclair Microdrive, but bigger! To sum up “The Transactor” magazine, it’s all about the history of Commodore computers, written by expert enthusiasts, from the first PET, subsequent later PET or CBM models (brand name changed due to a complaint by Philips) and that if you understood the earlier Commodore computers, then it should be child’s play to understand the VIC-20 and the Commodore 64. Of course, this magazine was running for some time before it was available at newsagents in Canada and the USA instead of just by subscription, and I don’t remember ever seeing an issue in London, as in Britain, not London, Ontario! I now think it should have been sold at all shops selling Commodore computers in Britain. As usual, TMR, who first learnt to program on a Commodore VIC-20 instead of the much more complicated C64, has tried to undermine and dismiss my posts, this time about the fact that most Commodore 64 buyers were unaware that they were getting a computer which couldn’t be programmed in the way that nearly all non Commodore computers could be programmed, by which I mean programming simple graphics, sound, and games in the BASIC built in on ROM. This was because they hadn’t read or heard any warnings about it. As far as I remember with my amazing memory, back in 1984 there was a serious lack of magazines not dedicated to one make or model which published computer reviews. I’m not counting American magazines which were available, because they featured nearly all American computers, due to trade protectionism. I thought I should probably buy a computer made by a British/European company. It was only the Commodore 64’s and Atari’s “synthesizer chips” that made me consider otherwise. No computer magazines in other languages seemed to be available, due to language censorship. There were magazines published mainly monthly, about various makes of computer, which included one or two reviews in each issue, as well as “What Micro?”, where obviously the title is self explanatory. Other magazines included “Personal Computer World” or PCW magazine, “Personal Computing Today” (including BASIC listings with hints on conversion to other BASIC dialects), “Your Computer”, “Computing Today”, “Practical Computing”, “Computer Choice”, which seemed to be a buyers’ guide I never read, and “Big K”, mainly about games. Apart from this, there were the weeklies “Popular Computing Weekly” and “Personal Computer News”. You can find some of these magazines on http://www.archive.org . 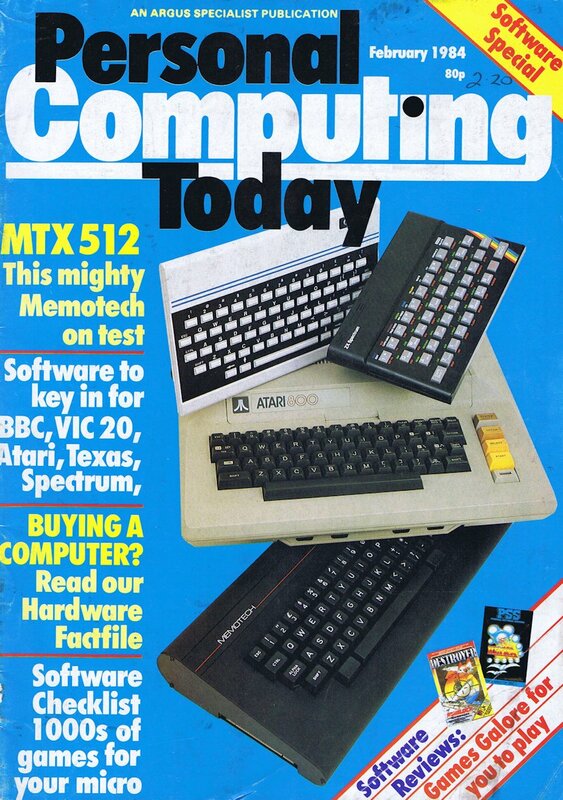 After buying a Commodore 64, then for as long as possible, after buying an Amstrad, and an Amiga, I usually bought “Popular Computing Weekly”, but not “Personal Computer News”, which I don’t think was very popular. “Popular Computing Weekly” later launched a purely games based spin off, which may have been called “Computer Gamesweek” and later faced competition from the newly launched “New Computer Express” until the weekly computer magazines nearly all died out, leaving just monthlies, apart from “Micro Mart”. I think it would probably have been a good idea to try and get hold of a back issue of the general consumer magazine “Which?” if they had ever done one specialising in computers, but that would have taken more time and effort, so I just bought magazines which were readily available, from newsagents. Of course, various computer journalists either didn’t know much about computers but had been told by their publisher to try and write about them after reviewing video recorders, or they were experts who had built kits and been using computers since about 1978 or even earlier, who thought “BASIC is for wimps!”, or they were open to suggestion and persuasion by computer manufacturers, or perhaps they just didn’t care, so all this could easily explain why not many warnings were published about the Commodore 64 with its crappy BASIC V2. If it had been a car or motor bike with a very complicated, or crappy driving system compared with other cars or bikes, or a brilliant hi fi system, but with controls so complicated that most people couldn’t use it, then it would DEFINITELY have been mentioned! Perhaps the manufacturers of the car or motor bike with this crappy or complicated control system could have sold an adaptor or upgrade to people who had bought their vehicles to fix the problem for let’s say £50, or how about £150? Sounds like “a nice little earner”, as Arthur Daley the conman in the classic ITV series “Minder” might say. This series was on ITV while I owned a Commodore 64. The early Commodore 64 KERNAL ROMs were buggy, as mentioned by “The Transactor” in Volume 4 Issue 2 Page 21. They were summed up as “TAB and SPC”, “Prompt Suppress After CONT”, and “Screen Editor Crash”. The screen colour RAM setup was changed and the INPUT command also had a bug, as described in the article “The INPUT Glitch” in Volume 4 Issue 5. This means that if the question in your INPUT command is longer than 39 characters, then you get the error message “?REDO FROM START”. I think I learnt I was supposed to use a PRINT command to print the question, instead of embedding it in an INPUT statement at all. Apart from this, the use of the C= key when loading from cassette was also changed. Of course, various other computers brought out before and after the C64 also had different ROM versions and the manufacturers gave programmers guidelines about using jump tables and techniques to avoid so that their software would still run on later ROM versions. These computers included the Atari 8 bit range, the Sinclair Spectrum, and the Amiga, which was largely a follow up to the Atari 8 bit range. As for Commodore BASIC versions, from what I’ve read BASIC 3.5 and BASIC 7 can run BASIC 2 programs unless certain PEEKs and POKEs are used. BASIC 3.5 only appeared on the C16, Plus/4, and C116, which had incompatible hardware to the Commodore 64. 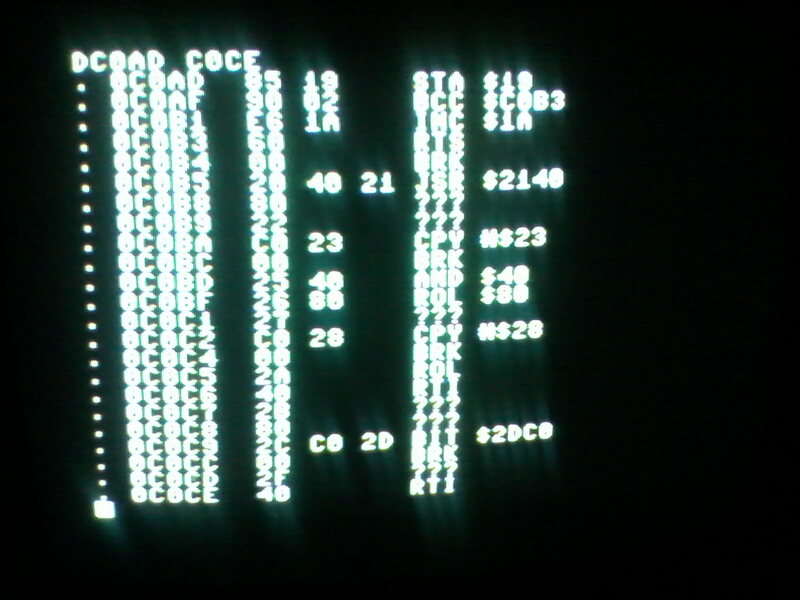 I can load Commodore BASIC V2 programs on my C128 in BASIC V7 and list them, but they won’t always run, because POKEs to certain VIC-IIe chip and possibly also SID chip and even other chips’ addresses aren’t allowed, only to “shadow registers” at different addresses, as well as there being some interference from the improved BASIC screen editor with its Escape codes, which occupies the popular addresses for Machine Code programs starting at $C000/49152. I think this proves that there was no need for Commodore 64 owners to ever have suffered BASIC V2 hell! Finally, I’ve found another Commodore 64 warning in the February 1985 issue of “Personal Computing Today”, which came up in a Google search and is on http://www.archive.org . I actually remember from seeing the pictures used that I actually bought and read this issue in 1985. It was too late to save me from buying a Commodore 64, but from the tone of the article called “Hardware Factfile”, starting on P74, this was a regular feature and contained information they’d published before. I don’t know how I managed to miss out on reading this. Their Commodore 64 review included the very damning sentence “One of the most versatile of the home computers, the CBM64 is renowned for its graphics and sound, but these functions are not easy to use, and require extensive use of the PEEK and POKE commands”. They also said about the Commodore 16 that it “has an advanced BASIC, received favourably by software houses and educationalists”, while the BBC Micro has “Excellent operating system and BASIC language employing procedures”, also that the Tatung Einstein has “very good, powerful BASIC”. Nice one, “Personal Computing Today”! This may have saved THOUSANDS of people from buying a Commodore 64!!!! Recently, as part of my extensive research, I’ve been searching online archives, as well as eBay, to find some magazines with reviews of the Commodore 64 which gave potential computer buyers, who were deciding which computer to buy, some warning about the Commodore 64, unlike the review I read in “The A-Z of Personal Computers”, which listed full reviews of lots of computers in a single volume, but no other magazine seemed to do this. I’ll be dealing with that magazine in a separate post. I think I’ve found THREE magazines which gave people some warning about the shortcomings of the Commodore 64. Unfortunately for me, two of these three magazines weren’t available to me back in 1984, because they were published in different parts of the World. These magazines were “Bytes & Pieces” from New Zealand and “The Transactor” from Canada. I only heard of “Bytes & Pieces” recently from watching YouTube videos of Tezza’s Classic Computers, so well done Terry “Tezza” Stewart! The other magazine was “What Micro”, published here in Britain. In 1984, I actually read the buyers’ guide “The A-Z of Personal Computers” and it was the totally biased, misleading drivel they wrote that made me think it was OK to buy a Commodore 64. I’ll be posting the full story about this in another article in the near future. “The Transactor”, which I posted recently fixed Commodore BASIC V2 in 750 bytes, was a Canadian magazine which had catered for Commodore PET users since the early days of 1978, including lots of short 6502 Assembler/Machine Code listings. It took its name from the T in PET (Personal Electronic Transactor) and for some time was available only by subscription, not in newsagents. It was published by Commodore, which had their HQ in Canada, but they eventually cancelled it in favour of their US magazine, although it managed to continue after one of their advertisers agreed to sponsor them! In their Vol. 4 Issue 1 (September 1982) they did a “preliminary review” of the Commodore 64. This review mentioned a few important things. It pointed out that the Commodore 64 only had 38K of RAM available to BASIC. Another important disclosure was that they thought it should have had BASIC 4 instead of BASIC 2, because of the additional disk commands, presumably CATALOG and DIRECTORY, instead of the pathetic LOAD”$”,8 followed by LIST. Their review also mentioned plans for an extended BASIC with support for graphics and sound! I think all of this knowledge would have prevented me from buying a Commodore 64, but that issue of this magazine wasn’t generally available, not even in Canada! Apart from this, The Transactor also had a news item later on, saying that less than a year after being released, the Commodore 64 was already being fitted with a THIRD version of its Kernal ROM to fix bugs in the first two versions! Of course, some early software wouldn’t work with the new ROMs. Furthermore, the monitor port was about to be changed from 5 pins to 8 pins! So much for the “Commodore 64” being the World’s best selling “single model” of computer produced from 1982 to 1994!! As it was already incompatible with earlier production versions, Commodore may as well have upgraded its BASIC ROM as well!!!! A Machine Code listing of 750 bytes in The Transactor managed to provide the most essential five graphics routines to turn on the graphics screen and set a palette of four colours, detect the colour of a pixel, plot a point, draw a line, and return to the text screen! Of course, lots of people reading this will already know that the SID chip was also upgraded to fix a bug or “improve” it, although this upgrade didn’t meet with everyone’s approval. I think there may even have been as many as THREE different versions of the SID chip! “Bytes & Pieces” was a New Zealand magazine, catering to the local computer market. I doubt it was sold in any other countries. In New Zealand there were problems caused by the low population of 2-3 million, as well as that country not being very close to any other large land masses, so it was expensive to import computers and it seems that all computers arrived later in New Zealand than to most other developed countries. To get round this, a few computers were designed and manufactured in New Zealand although the economy was mainly agricultural. These included the Poly, mainly for education, and the Aamber Pegasus, which was fairly innovative with switchable language ROMs, but may have sold only about 100 units. In their Issue 2-04 (December 1983-January 1984), where they printed a buyers’ guide chart listing the features of all computers available in New Zealand, “Bytes & Pieces” magazine said of the Commodore 64 that “most graphics programming needs to be POKEd and PEEKed from BASIC”, as well as “the machine includes 64K RAM, not all of which is available under BASIC (39K”), so this revelation could have been enough to save me from buying one. My Dad would probably have been put off just by the disclosure that only 39K was available to BASIC. The magazine also praised the new Spectravideo 318 as having the best BASIC of any computer, which was described as a 32K version of Microsoft BASIC, with an on screen display of the function key definitions, that very impressively changed when the user pressed the SHIFT key “usually only found on upmarket business machines”. The review was complete with three BASIC listings covering interrupts from BASIC, sprite collisions, as well as using DRAW and PLAY with the built in graphics macro and music macro commands. As you should remember, it was the inability of the Commodore 64 Group Leader at my local computer club to add a routine to make sprites bounce off each other to my existing program of two TARDIS shaped sprites crossing each other’s paths which made me finally give up on the Commodore 64! Unfortunately, the Spectravideo 318 wasn’t available widely and not for long before the very similar MSX standard computers were released. The Spectravideo 318 and 328 seem to have made an impression in Australia and New Zealand, though. Some of these computers were sold off after the MSX launch by Silica Shop in London and via mail order, advertised as one of several cheap computers, saying they were “fairly new to the UK”. Spectravideo brought out an adaptor to convert their 318 and 328 computers to MSX, as well as releasing the Spectravideo 728 and the Spectravideo X’Press, which were both MSX computers. “What Micro?” was a monthly computer magazine published in Britain, which was available at most newsagents, so this means it probably had a bigger circulation than “The Transactor” and “Bytes and Pieces” put together. It published reviews of computers which had recently been released or which hadn’t just been released, but were proving popular, such as the Sinclair Spectrum. They also had a guide listing all computers available under £6,000, which compared their facilities, but only said a few words about each of them. 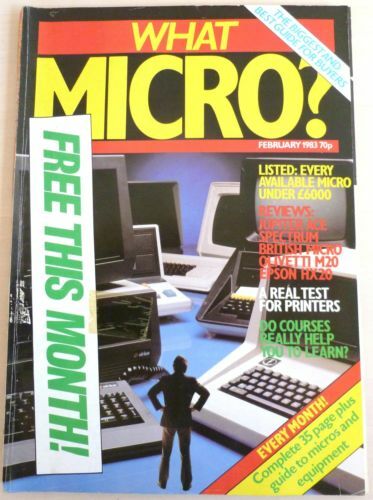 I couldn’t find any scanned editions online, but I recently managed to buy a copy of the “What Micro” February 1983 issue from eBay to see exactly what advice they gave. The Commodore 64 was listed in their “35 page guide to micros and equipment”, which they published every month. The most revealing part of the listing came under the column marked “Comments”. This said “Simons’ Basic (extended Basic using full colour/sound/Basic tool kit), Prestel, Sprites” , which may have led me to find out just enough information to avoid buying a Commodore 64 complete with its crappy BASIC V2 and a total of only 71 or 72 commands! So, congratulations to “The Transactor”, “Bytes & Pieces”, and “What Micro?” magazines! Shame on you “The A-Z of Personal Computers”! I’ve recently answered some more comments about old posts on this blog. These have been mentioned by TMR on his blog, but I must point them out here myself. One of these comments/posts/replies was about the amazing Acorn Electron computer. This computer fulfilled two roles. It was a cheaper alternative to Acorn’s BBC Micro selling at £199 instead of £399, because it didn’t include lots of interfaces, while also being a follow up to and replacement for the Acorn Atom. 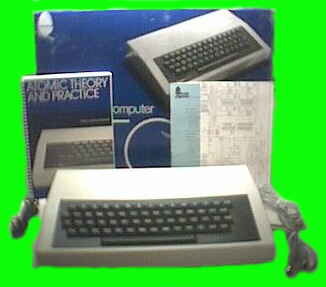 It had BBC BASIC on ROM, but no Teletext MODE 7, so it could be used for studying most of the many tutorials around at the time which formed part of the BBC computer literacy campaign and could even run some BBC commercial software, although various BBC software not even in MODE 7 wouldn’t run and required special Electron versions to be produced because all the Electron’s chips except the 6502 CPU were different from the BBC Micro. Compared to other computers, the Electron had a reasonable number of colours (8 actual, 16 logical), and a reasonable amount of RAM (32K). It was even featured instead of the BBC Micro on the highly educational ITV series “Me and My Micro”, presented by Fred Harris, showing just how capable it was. 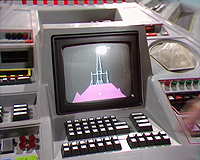 It can be summed up as producing the look and feel of a computer in a classic BBC sci fi series, such as Doctor Who or Blake’s Seven. It was even featured in Doctor Who various times! Here’s a review of getting started on the Acorn Electron http://www.youtube.com/watch?v=VQRBzZlRmOk . Unfortunately, according to the buyer’s guide “The A-Z of Personal Computers”, which I read, a major feature of computers was what kinds of sound effects or music they could make, although what type of BASIC interpreter they had built in was more or less irrelevant and hardly worth a mention. Most computers had “Basic”, so were presumably the same version of this language, while some had a BASIC different enough to be prefixed with a name, such as “BBC BASIC” or “Atari BASIC”. I quickly disqualified the Acorn Electron from my short list of computers because it had only monophonic sound, while several other computers (including the C64) had 3 channel synthesizer chips built in. Later on, I was very annoyed with “The A-Z of Personal Computers”, after finding out how crap C64 BASIC V2 was and also when I found out that it was possible to get the Electron to play 3 notes simultaneously using Machine Code software instead of BASIC. Unfortunately, the BBC BASIC sound command ENVELOPE has no effect on the Electron, though. Of course, the Electron wasn’t as expandable or as fast as the BBC Micro, but would have saved me all the stress of trying to learn programming on the Commodore 64. I should remind you here that computers are supposed to be mainly for computing, meaning working things out, not mainly for playing games, although they do have to work things out to play games as well! When it came to computing, the Acorn Electron wiped the floor with the Commodore 64, because it came with the very advanced academic style BBC BASIC, which incorporated parts of PASCAL or COMAL, including the commands PROC, DEF PROC, and END PROC for procedures, REPEAT…UNTIL, and long meaningful variable names, while maintaining compatibility with Microsoft style BASIC. Typing BASIC programs on the Electron is much easier than on the Commodore 64, because it has a set of keys which allow single keyword entry of various commands when used with the function key, but my Commodore 64 function keys went unused for keying in BASIC, because there was no command to define them. Unlike in Sinclair Spectrum 48K BASIC, this system isn’t compulsory and the BASIC commands can be typed letter by letter instead. Of course, the Electron and BBC Micro had various high quality games available for them, but didn’t get as much support as they deserved. A very well known game which was first programmed on Acorn computers (i.e. Acorn Atom and BBC Micro), released simultaneously in BBC Micro and Acorn Electron versions, was “Elite” by Dave Braben and Ian Bell. The Electron version is in mono, while the BBC uses a custom split screen mono/colour mode. These two programmers ported it themselves onto the Commodore 64, which was sluggish compared to the BBC version, because the C64’s CPU runs slower than the BBC Micro’s CPU, although it could hold the whole program in RAM at one time. Of course, the Electron is also slower than the BBC Micro. David Braben got an earlier computer, the Acorn Atom for Christmas 1981, which was cheaper than the newly released BBC Micro and came with only 2K, but he fitted a RAM upgrade, then started programming 3D vector graphic spaceships on it in Atom BASIC, the forerunner to BBC BASIC. The Acorn Atom was discontinued in 1983. Later on, he converted these routines to 6502 Assembly Language, which was built in to the Acorn Atom, without the need to buy a separate Assembler. Of course, he probably wouldn’t have been able to do this on the Commodore 64, because that computer had no built in commands for graphics, or a built in Assembler. After a few years of programming “Elite” on a combination of the Acorn Atom and BBC Micro, it was released by Acornsoft for the BBC Micro and Acorn Electron in late 1984. The Acorn Atom was discontinued in 1983 and only had 2K RAM. It would have been impossible to write this game in BBC BASIC and compile it, because it used the whole 32K RAM, while Simons’ BASIC leaves only 30K on the C64. The following year, Dave Braben and Ian Bell ported this game to the Commodore 64, which used the 6502 compatible 6510 CPU, while another company was given the job of programming a version for the Z80 based Sinclair Spectrum. Also in 1985, a similar game called “Starion” appeared on the Z80 based ZX Spectrum and Amstrad CPC computers, only about 9 months after “Elite” was released. It should be obvious from this story to anyone that David Braben and Ian Bell learnt how to program the Commodore 64 by programming Acorn computers. If they’d both had the Commodore 64 as their first computer, then I seriously doubt they’d have been able to program “Elite” at all! Perhaps they may eventually have managed to create the first version on a C64, but by that time people would have wanted it to run on an Amiga, Atari ST, PC, or Mac, which used 68000 or 80×86 processors and had a lot more RAM. In recent years, Dave Braben has helped to form the Raspberry Pi foundation, which produces the Raspberry Pi computer. This is an attempt to bring back programming to the masses after Microsoft Windows, as well as Mac OSX have been supplied without any programming language for some years now. The Raspberry Pi is based round the ARM (Acorn RISC Machine) processor originally developed by Acorn computers and used in their Archimedes range. The Raspberry Pi loads a file from an SD card, which it treats as its OS. This can transform the Raspberry Pi into a wide choice of computers, such as a Linux box with Brandy BASIC (a BBC BASIC clone), Ruby and Python, an Archimedes running RISC OS, or a Sinclair Spectrum emulator. It’s all thanks to Acorn Computers! Finally, here’s a link to a page giving details about how the BBC Micro was used as the TARDIS console computer starting with the 5th Doctor (Peter Davision) http://www.themindrobber.co.uk/tardis-console-five-doctors-colin-baker.html . BTW, it also appeared as Dastari’s computer in “The Two Doctors” showing lots of text typed into BBC BASIC, ending with the error message “String too long”. FIXING C64 BASIC V2 IN 750 BYTES! The front cover of the magazine which published this amazing program! I’ve recently been amazed by some more little known information I’ve found in a small magazine called “The Transactor”, published by Commodore Canada and available for download on http://ist.uwaterloo.ca/~schepers/transmag.html . This magazine was so good that Commodore decided to cancel it, to be replaced by its US magazine, but then “The Transactor” managed to continue after getting sponsorship from one of its advertisers. In their Volume 4, Issue 4 edition, dated July 1983, there was an article with a type in listing called “Graphics Utility”, written by a well known Commodore PET programmer called Brad Templeton. Obviously, this program was written only a few months after the Commodore 64 came out, so there was no way anyone could have learnt how to program many things on it by that time, if it had been their first computer. An Internet search reveals that Brad Templeton worked for the software house Visicorp (creators of Visicalc), which at one time was bigger than Microsoft, and he programmed commercial software such as “Time Trek” for the PET, “Checker King” for the PET, Apple ][, and Atari 400/800, the PAL Assembler for the PET and C64, as well as the utility package Power for the PET and Power 64 for the C64. All of these computers speak 6502 Machine Code. He also programmed most of Visiplot for the IBM PC, used Arpanet starting in 1979, and Usenet starting in 1981, but I’m not sure what computers this was on. As they were text based, I think most computers at the time with the right software and a modem could handle this. He’s done lots of Internet related things since then. To sum up, my point is that before programming the Commodore 64 he had programmed the PET and used computers for at least THREE YEARS before this amazing program “Graphics Utility” was published. The program “Graphics Utility” is a short, quick fix for Commodore 64 BASIC V2, adding Machine Code routines for turning on and clearing the lores multicolour graphics screen, setting up its palette, plotting a point, drawing a line, detecting the colour of a pixel, as well as returning to the text screen, which were all things that the Atari 400/800 and Apple ][ computers could already do in their dialects of BASIC. These are the bare essentials, but there seems to be no way to set the other 12 colours without clearing the screen again, use the hires graphics screen, or to specify vertical Y as well as horizontal X coordinates before printing a character on the text screen. I should also mention at this point that the Commodore BASIC command SYS could have various parameters following it after the RAM address, but Commodore often failed to mention this! Of course, most dialects of BASIC at the time didn’t have a command to fill or paint enclosed shapes. The most important thing about this article is that it makes the point that extended BASICs are no good for writing “transportable programs” which will run on someone else’s Commodore 64. From this and the general tone of this article, we can conclude that these routines were made to be redistributed without paying any royalty fees! This means that Brad Templeton and The Transactor magazine actually more or less fixed Commodore 64 BASIC V2 in mid 1983 in a magazine published by Commodore!!!! I tried disassembling this code in the C128 built in MONITOR, to try and work it out, but I found that a lot of the code was opcodes I haven’t yet studied and some of it wouldn’t disassemble at all, just listing ??? instead of a disassembly. I’ve recently found that Jim Butterfield’s book about Machine Language for Commodore computers has become very hard going, so now I’ll have to study a 6502 book not about Commodore computers at all. I think that what was desperately needed at this point was for Commodore to include a cassette of this amazing software, as well as a copy of the original article accompanying it, with every single Commodore 64 sold anywhere in the World from that point in time! Not long after this, they could have incorporated these routines into their BASIC ROM and actually given them names, such as LRG, DRAW, PLOT, POINT, and TEXT. Don’t forget that this Machine Code program only took up 750 bytes. The Commodore BASIC V2 ROM on the C64 was 8K, but it was only one of FOUR ROMs in the C64, so don’t bother telling me this couldn’t have been done! I rest my case.